Home › Blog › When Your Toothbrush Isn’t Handy, Reach For Scrubber Foods! When Your Toothbrush Isn’t Handy, Reach For Scrubber Foods! WE’VE ALL BEEN IN SITUATIONS WHERE we’ve wished we had a toothbrush—but didn’t. Perhaps it was on a recent camping trip. Perhaps it was right after lunch, on a day when you were headed into an important business meeting. Regardless of when it was, you knew that a fresh, sparkling smile would bring the comfort and/or confidence you needed. Certain types of foods can help you in a pinch. 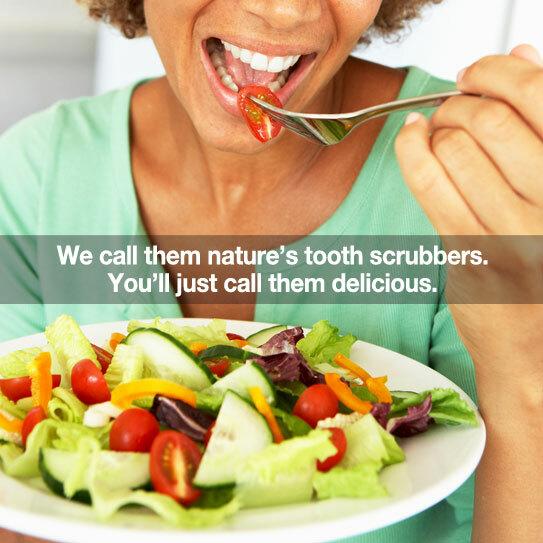 Scrubber foods naturally clean your teeth–not perfectly, but enough to help you smile with confidence. As you chew scrubber foods they remove plaque and leftover particles from other foods you’ve eaten. They also increase saliva flow, which helps clean your mouth as well. All of these foods are excellent at freshening your mouth. Use them at the end of a meal or after a snack. Remember that these foods cannot be used as a replacement for brushing and flossing. But, they can be little helpers until you get to your toothbrush. Try finishing up meals with scrubber foods instead of sweets and let us know if you notice the difference. You may never go back! Do you know of another great scrubber food that we haven’t mentioned? Share your tip below. Thanks for your continued trust in our practice!